For a peace of mind when you are in your health club, interviewing a potentially dangerous criminal or require restricted access to the contents of a cabinet. A self contained electronic locking module for lockers and other cabinets. Fully enclosed in solid steel plate. Equipped with our own type " C " battery holders. 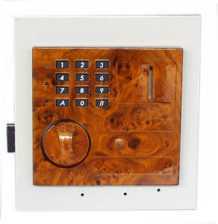 All you need is to provide a panel cut-out in the door to pass the keypad housing through. Very user friendly. 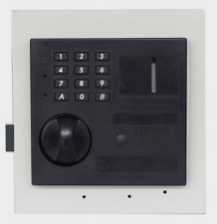 User programmable 3 - 8 digit code and facility management programmable 3 - 8 digits override code. As well, a mechanical, high security, concealed lock is incorporated. We can change the shape, size, and colour of the front housing to suit your needs. We can incorporate your name as part of the housing. Membrane switch or telephone-type keypad can be used to suit your particular requirement. Tell us what you need and you will be pleasantly surprised at what we can do for you and how competitive we can be. Standard size: 215mm (8 1/2in) W x 215mm (8 1/2in) H x 35mm (1 1/8in) D. Other sizes can be custom made for your particular cabinets or lockers. Can be used with metal or wooden cabinets. Supplied to locker and cabinet manufacturers only.